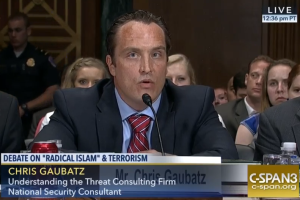 UTT’s Chris Gaubatz testified on Capitol Hill Tuesday before a U.S. Senate hearing on the use of the term “Radical Islam” in discussing the terrorism threat to the United States. With a strong finish, Mr. Gaubatz made clear the dire threat America faces if we do not reverse course immediately and address the enemy. In addition to the revelatory testimony of UTT’s witness at said hearing, based on his first-person findings stemming from tedious undercover research at CAIR, i.e. conducted alone on behalf of the American people, at great risk to his life, another witness ostensibly representing Islamist & quisling opinions diametrically opposed to UTT’s comprehensive analysis, was associated with THE BRENNAN CENTER FOR JUSTICE, a left-leaning New York/Washington DC based public policy institute founded by the family and former law clerks of late Supreme Court Justice William J. Brennan, Jr., who the Washington Post once characterized as the “progressive voice of the modern court”. Inasmuch as George Soros is a major donor to the Brennan Center, and it’s president is Bill Clinton’s former speechwriting director. And in the past the center has: opposed voter ID laws; represented terrorist detainees at Gitmo, as well as U.S. citizens & legal residents being held there as unlawful enemy combatants; challenged congresses right to deny habeas corpus to Islamic terrorists, as well as the president’s right to declare a prisoner to be an unlawful enemy combatant, the question is who should the American people believe is dedicated to their literal destruction; compare the foregoing resumes, and see what you think; and the survival of the people you love, and of the country, depend on the right answer. Chris’ testimony was absolutely compelling. He concisely and clearly wrapped CAIR/Hamas up with a nice bow, in such a way that the few liberal/clueless hit pieces in response to his testimony that I could find on the Internet, failed miserably to factually dispute any one of the points made in his testimony. In typical liberal fashion, when unable to fight fire with fact, they could do little else but call him names – which is always the sign that a nerve has been struck. Their inability to cite any facts in dispute to his testimony, only confirmed to me what I have long suspected: Muslims angling to take over governance of the US (and her people) have indeed infiltrated highly coveted, high-level positions that will enable them to further their radical agenda of Sharia. I am thankful for his service – and the sacrifice Chris made – so that Americans, if they will just wake up to this uncomfortable- if not truly terrifying – truth, can take the necessary steps to protect ourselves and our country from those hell-bent on destroying us. In my opinion AmericA has been under Islamic terrorist attack since the Wahabi’s started buying land in the US and building Mosque.and recruiting/deceiving who they could …..even Casious Clay converted to Islam. But I think he was only given enough information to try and give this wretched belief system a positive face. Or he was one of very very very few true moderate Muslims.But regardless it is a doctrine of hatred and murder. And Sharia is the total opposite of humanitarian law and it completely Opposes any other law put before it by means of terrorism and inhumane savagery. I read somewhere that Malcolm X after converting to Islam later after finding out more than he should have was murdered by the very sect that he had joined because they were afraid he would talk to the feds. Otherwise Vote for Donald J.Trump for President in November! Because any other vote or NO vote is a vote for tyranny! Thanks so much For Standing with our Christian Nation USA Mr.Gaubatz! !